It has Been a long time since I made curry, but after I got a fresh fish fillet and some large scallops, and the only recipe I came up with is choo chee red curry with salmon and scallops. 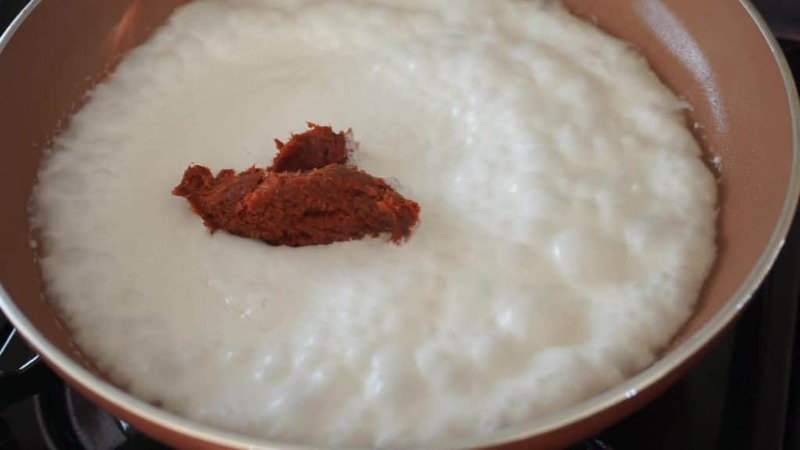 If you’ve ever cooked any Thai curries, you probably know how to make coconut milk “cracked” which makes the curry even more smooth and toothsome–coconut oil is a healthy fat, oh yeah! You might wonder what is “choo chee” means, and it’s not even a word. Well, I found out it stands for the sizzling sound when the juicy fish fillets touch the hot oil on the pan surface. It’s making a sound of cheeeee, and people made it up as choo chee nowadays. That means you can’t use it in any other cooking methods because it won’t sound the same. Let’s make this recipe. The cook time takes not over than 20 minutes so that you can make it for breakfast or lunch or brunch. 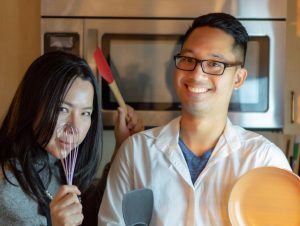 The day before, Amy and I went shopping, and we had no idea what to cook. At the seafood section, I peeked fresh salmon fillets, and Amy didn’t want sushi anymore (as it’s her favorite food after Thai food). Plus, we wanted something spicy and saucy to eat with rice—yes, mom always cooks a lot of rice. This recipes suddenly came across my head, Choo Chee red curry with salmon and scallops. Ok, let’s find scallops, everything else we already had in our kitchen! Today morning, we got up early and got excited about breakfast. I started by drying the fillets with paper towels. 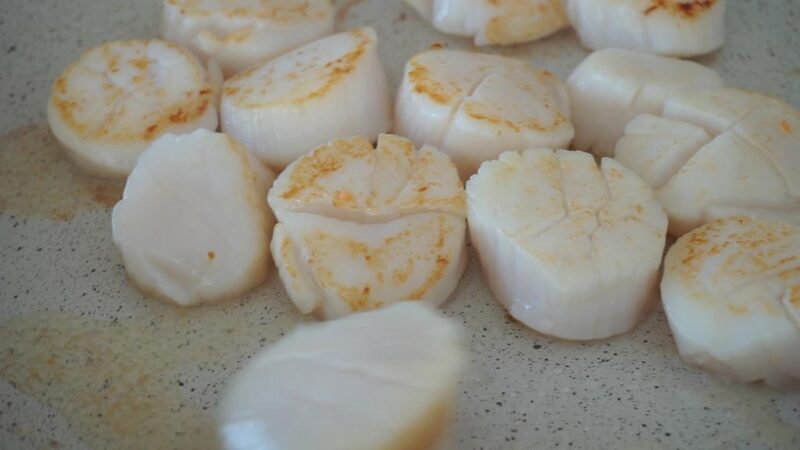 Also with the scallops, I dry them because It will give excess juice when pan-searing, and it might turn out boil-feeling. Using coconut oil to cook is always the healthier choice instead of vegetable oil or canola. I use it all the time when stir-frying, pan-searing, vinaigrette for salad, or face-masking(just kidding, different kind of coconut oil). However, when it comes to deep frying, I use sunflower oil for the higher smoking point. Use medium-high heat if you use a gas stove, or on high if electric. By placing the skin down slowly, it won’t sizzle to your face(hand is enough! ), and I hate when salmon stick to the pan. 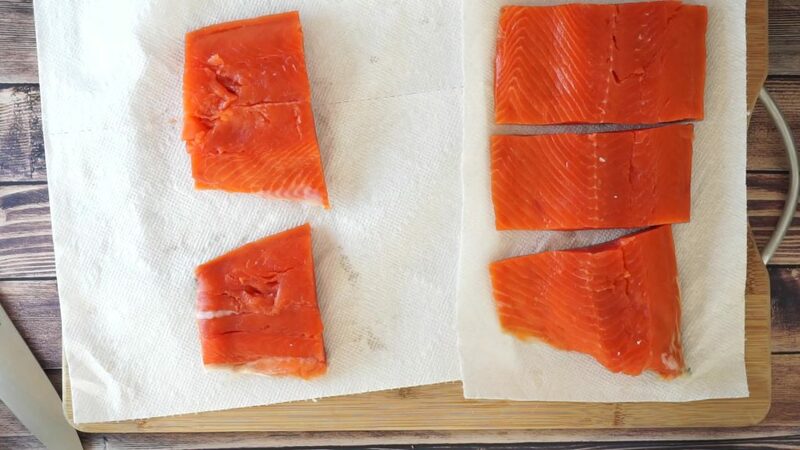 Turn it when you see it begin to cook at the bottom layer(probably 5-7 mins) and turn it again until salmon is golden brown and turn crisp. 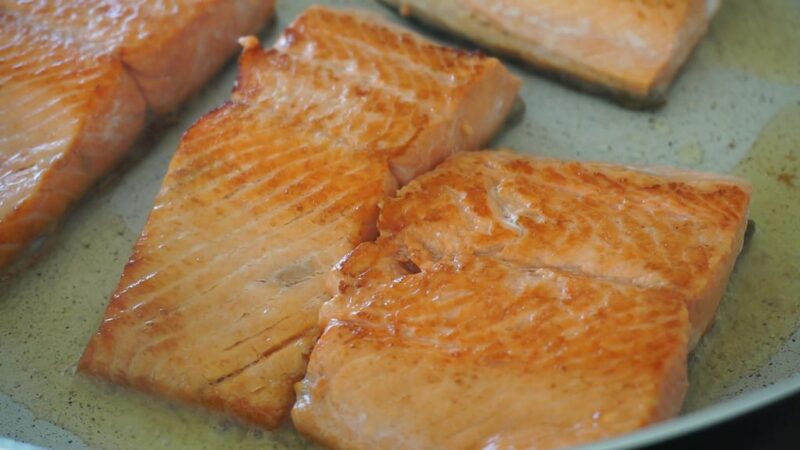 I like the way salmon isn’t cooked the way through, leaving its juicy inside is much more mouthwatering. Also, do the same with our giant scallops. Ok, done. Let’s make the curry sauce. Coconut milk contains fat more than 60%. If you heat up for a period, it will separate the layer of oil and juice. 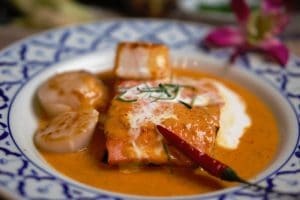 When you make red curry with chili paste, the fatty layer infuses with herbs aroma, and it gives you a smooth, aromatic flavor. 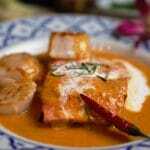 In this step, simply heat up the coconut milk until it begins to bubble, then add Mae Ploy red curry paste and mix it. Lower the heat so it will not over-bubbling. The mixture starts to separate in red, next season it with fish sauce and sugar according to the recipe sheet below. 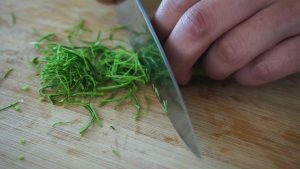 Don’t forget to sprinkle shredded lime leaves to enhance the flavor. Do you still have the fillets ready? Or the cat has taken it away? While the sauce still hot and sweet-smelling, make the sauce flowing on top of the fillet. Plus, pour some pure coconut milk over to make it look awesome! To eat, I have a scoop of hot jasmine rice already on my plate, and first, cut the fillet with your spoon, splash some sauce to it and put in my mouth. Then, I follow with rice helping my mouth not beaten by the spicy red curry sauce. Luckily, I have a bowl of leftover Tom Zap soupwhich has a sour-side taste to eat with so my breakfast is complete with 3 flavors, or I recommend to make a side condiment, Thai dipping sauce, to even make the meal lip-smacking! Would this take more than 20 minutes? Share this if you make one! Dry the salmon fillet and scallops with a paper towel, heat the pan to medium high and drop a coconut oil. Slowly place the fillet skin down first (use a splash guard if possible), turn it occasionally. Same as scallops, sear them with coconut oil on medium-high heat. 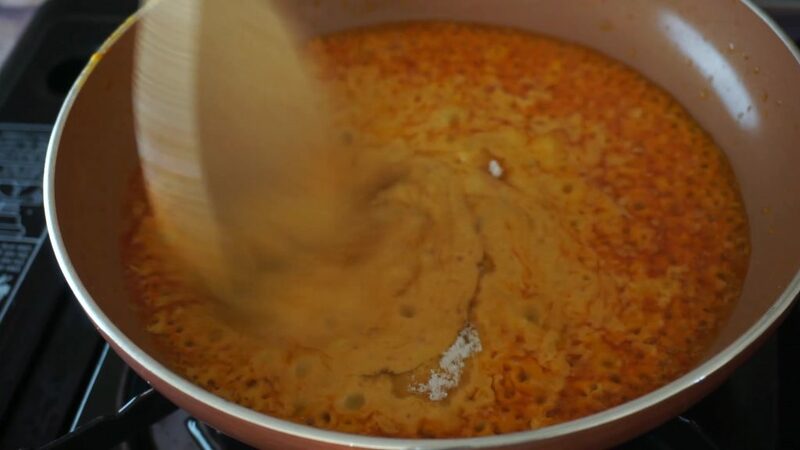 Meanwhile, add coconut milk in a pan and heat until begins bubbling, then add red curry paste and stir. Pour the curry sauce on top of the seared salmon and scallops. Also, top with pure coconut milk and sprinkle some lime leaves.